For helping you with the newest developments of GST in Tally, I have created Free Tally GST Course Online for everyone who wants to learn GST in Tally. You will be learning the basics of GST in Tally which will help you gain a level of confidence that you can pass necessary entries for GST in Tally. As it is with the Free Tally Course Online, this is the Best Ever Free Tally GST Course Online. I have explained everything in 2 ways. A full post explaining the concept of GST in Tally. A Video explaining how you can actually do it. I highly suggest that you read the post and then watch the video. Also you can bookmark the post for future reference. Here you go. I have listed all the topics from the beginning along with a small summary to help you know what actually the topic is about. Start learning with Free Tally GST Course Online! Before you can do anything in Tally about GST, you have to upgrade it to new version 6.0 which includes the GST functionality. Without upgrading it, you cannot do anything in Tally about GST. Upgrading Tally.ERP 9 or any other previous version of Tally is as simple as downloading the latest version of Tally and installing it. Just don’t forget to take the backup of your data folder before upgrading Tally to be on the safe side. Go ahead and read the post about how you can upgrade Tally to the new GST version. After you have upgraded Tally to the newest version of Tally, it is now time to set up GST details in Tally.ERP 9. For that, first you have to enable GST in Tally and then setup all the details. Basically, you need to enter GST number, date from which it is applicable and so on. Once you enter all the details, it will be easy for you pass the necessary entries in Tally related to GST. 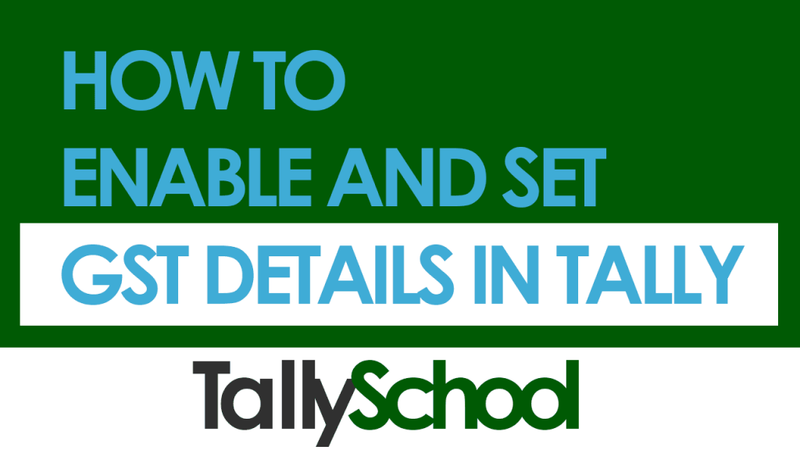 Head over to this post right now to enable and set GST details in Tally with this Free Tally GST Course Online. Passing GST Accounting Entries in Tally is as easy as passing simple purchase and sales entries in Tally. You just have to alter some settings and set the rates for different items or services you are selling. This post is quite long and will take a while to understand everything that I have explained. Once you understand the process, it will be easy for you to pass the GST Sales and Purchases entries with very much ease. Come on! Go ahead and read the post to know how you can pass GST Accounting Entries in Tally, especially Sales and Purchases Vouchers. Creating GST Invoice in the right format is very important since if you are not following the law, you can be penalized for that. Fortunately, in Tally.ERP 9, GST Invoice is prepared with taking into care all the rules and regulations of the GST law. 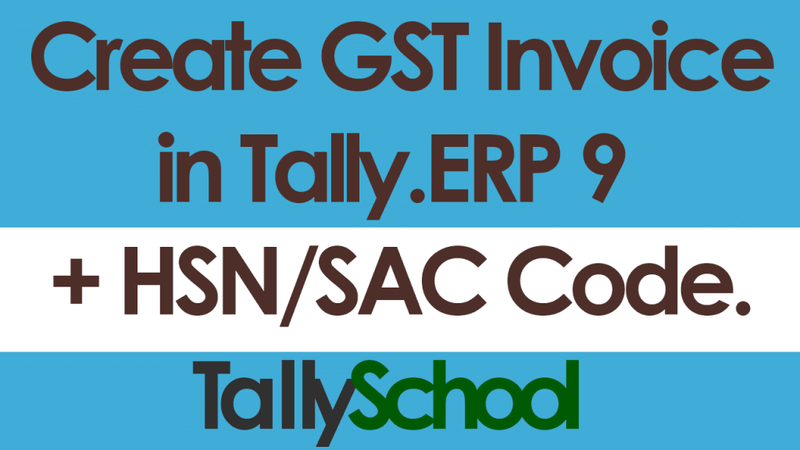 In this post, I have explained how you can easily create GST Invoice in Tally including HSN/SAC as well as taking care of the legal regulations. Read the post to know what are the details that are necessary and should be on the GST Invoice and how you can enable them in Tally.ERP 9. 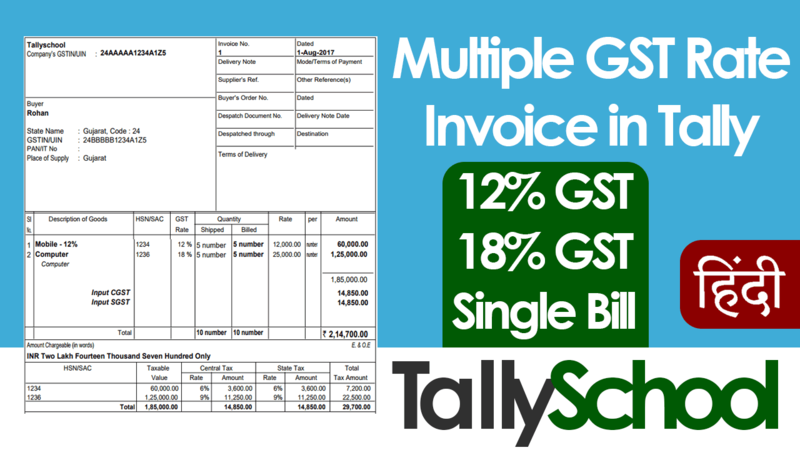 In this post, I have explained how you can create multiple tax invoice in Tally under GST. It can be possible that you are selling different products which attract different GST rates. To explain that, I have created this post along with the video in Hindi. You will learn how you can create products in Tally with different GST rates as well as passing purchases and sales entries with them. So, for example, you can pass a sales entry with Mobiles having 12% GST and Computers having 18% GST in the same invoice in Tally. Read the post and watch the video to know how you can do it. I will be adding more posts and videos to make this course the best ever Free Tally GST Course online. I am sure this course will help you a lot. If it helps you, please comment below or at the respective posts, that you liked it. And as always, if you have any problem or issue, comment at the respective page so I can help you better. Sir , I am Bintesh Prajapati my confusion is i want to discribe a subtotal in sale & Purchase invoice with Account only features , if it possiable then you gide me. Can you give me an example of what you want to do? That way, I can help you better. I want to become a Tally Expert. You can start from this course as well as the Free Tally Course Online! Respected Sir, i know all basic concepts of Tally..i am working as Tally Executive..i want to increase my knowledge base in Tally..Earlier said that for becoming Tally expert you are preparing CD..In this you are covering all topics of Tally including GST.. I replied you in your email. Is this Tally GST course a certificate course? Yes, it is a certificate course. You have to take the test for it and if you pass it, you can get a certificate. The test is free to take and if you pass, you can get a certificate issued online by paying a nominal fee of ₹299. 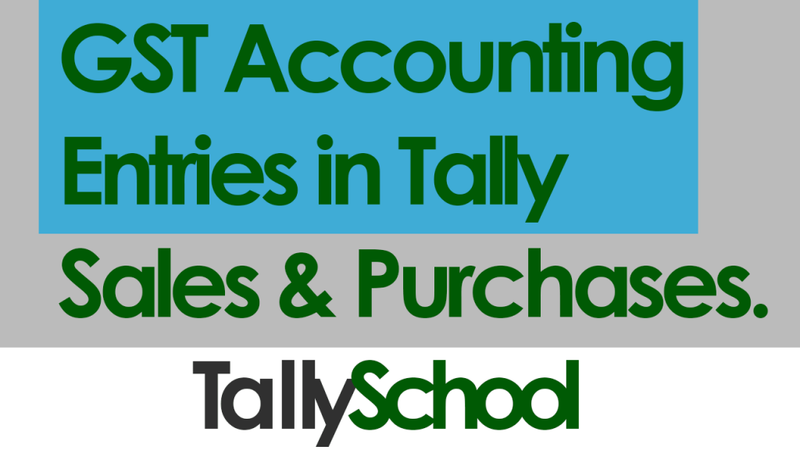 I have read in one of your blogs (https://www.tallyschool.com/gst-accounting-entries-in-tally-sales-and-purchases/), that while creating Sales and Purchase Ledgers, GST Rate that has been set for that Ledger, the same can be added in the Name to identify easily. In that blog, the Cess was set to 0%. In my case I have items with multiple tax rates and few items with different Cess and Additional Cess. So how should I define my Sales, Purchases and Tax Ledgers? Please reply..
You can also add Cess and Additional Cess in the name itslef. If it is in sales leger, it can look like this – Sales-18% C-5% AC-2%. In this case, C means Cess and AC means Additional Cess. 18% is the GST rate. This is just an example and you can set the rates of cess and additional cess which is applicable to you. It will be a simple sales entry only. You will have to enter Bank Charges as Direct Expenses while making the Sales Entry. In tally to create a sales invoice CGST and SGST is calculated over the value of stock items entered and the final amounts sums to the value entered plus the amount of CGST and SGST. Is there any way that we enter the fianl amount of stock item and basic value and SGST and CGST are calculated . Yes, there is a way and it is called entry of rate inclusice of tax for stock item. When you are in a purchase or sales voucher, go to configuration or press F12 and there will be a 1st option under statutory options for inclusive entry. Set that to YES and you will see a new column for entering inclusive amount. That is exactly what you are asking for. Sir I am a accountant in a private limited company. Mostly our sale in cash when cau you sujjest me how to prepare gst return. Whether the sales are in cash or not, the procedure for GST return filing in tally is the same. Here is the link to prepare GSTR-1 in Tally. Ji nahi. Commerce ke liye mai excel nahi padhaata hu abhi. I am Vishal Goyal from Jaipur. i am totally new to tally and trying to learn through online information only. I want to create a sales voucher where i can provide sales value inclusive of GST and all the other calculation are then performed by tally itself. how can i proceed with this. Also, I want to enter a fix standard GST inclusive rate for my stock items which will be directly displayed on sales voucher screen while selling that product. if required, i can change that value. There is an option in Tally, where you can enable the sales price inclusive of GST. While in Sales Voucher, go to the Configure menu by pressing F12 and you will find that option. For all other GST calculations performed automatically, you have to create a Class in the Sales Voucher Type. You can create it by altering the voucher type. Go to Accounts Info > Voucher Types > Alter > Sales. There is an option of Classes in there. Create it and you will find the options for enabling GST and other charges to be calculated automatically in tally. thanks for the instant reply. it helps a lot. Also, can you please tell me if we can put discount percentage for sales and purchase for any stock item while creating item. i want to fix these values while creating item itself so that i do not need to enter discount again and again in vouchers. There is no direct option for fixing the discount values in tally. You have to do it manually only. You can transfer funds from school to college. But you should know for what purposes you are transferring. After Tally I want to learn another course which is very much valuable now a day. Which course you recommend to learn which is in very much in demand. Pls guide. I am fine. I recommend you learn according to what you like. Certain courses are about data science, blockchain and so on.